The UR12 combines large, easy-to-use pushbuttons and a navigation joystick with a multi-page LCD touchscreen to provide streamlined control of your entire entertainment system. 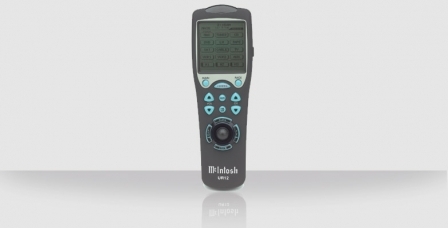 Touchbuttons and text on the LCD display can be customized to your preferences, and as many as 28 macro sequences can be programmed for one-button operating convenience. The UR12 has built-in commands for all McIntosh equipment as well as hundreds of popular brands. The UR12 can also learn new IR codes. Product Details: Features Enter a code or scroll through the list of component makes and models. Anything not on the list can be easily learned. A 5-way joystick handles the vector commands for on-screen and DVD displays. Touchscreen buttons and commands can be customized to fit any need. There are 60 Favorite Channel buttons and up to 15 Macro buttons, along with a PC data in/out port for adding codes and changing the interface. Best of all, the remote operates of just 4 AA cells - energy conservation and high performance in an elegant package.